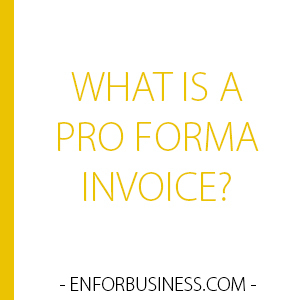 What is a Pro Forma Invoice? Definition: A pro forma invoice is a document sent by the seller to the buyer with the purpose of providing detailed information about a proposed transaction. This is mainly seen as a preliminary invoice sent when the transaction hasn’t been completed yet. What Does Pro Forma Invoice Mean? A pro forma invoice is mostly used in international trade deals. This document does not have the commercial or accounting value of a real invoice because it cannot be used to demand payment and should not be recorded at the company’ ledgers. The pro forma invoice is sent to the buyer in advance of the shipment and the regular invoice is usually delivered with the goods. With the pro forma, the buyer can be properly prepared to declare the value of goods to customs authorities and also has complete information about the transaction. It generally includes the kind of goods, quantity and price, weight and any other relevant data. It could also states shipping costs. On the other hand, in some cases, banks require a pro forma invoice for big-ticket purchases that require a credit analysis procedure to be done before the purchase is approved. Klinton Pharmaceuticals is a manufacturing firm located in the United Kingdom. The company exports products to several Latin American countries and every three weeks sends a shipment to his main customer in Colombia. When the customer places an order, the Sales Department agrees to commercial conditions and makes the customs arrangements to deliver the cargo. At that moment, it sends the pro forma invoice via e-mail to the customer’s Purchasing Department. With this pro forma, the customer can check if the products, the prices and other conditions are in line with the requirements and previous agreements. The customer then prepares itself for the arrival of the shipment and is ready to pay customs duties. The invoice goes along with the goods and, when received, is the commercial document employed to record the purchase.